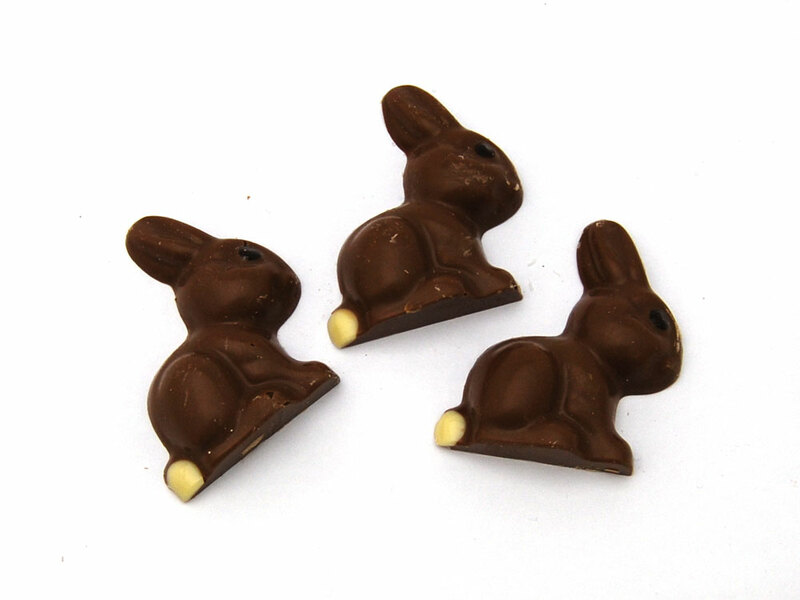 Milk Chocolate shaped into bunny rabbits. Each weighs 16g approx. Milk Chocolate: Sugar, Cocoa Butter, Whole Milk Powder, Cocoa Mass, Emulsifier (Soya Lecithin), Natural Vanilla Flavouring. Cocoa Solids 34% Min, Milk Solids 22% Min. White Chocolate: Sugar, Cocoa Butter, Whole Milk Powder, Emulsifier (Soya Lecithin), Natural Vanilla Flavouring. Cocoa Solids 28% Min, Milk Solids 25% Min. Dark Chocolate: Sugar, Cocoa Butter, Cocoa Mass, Emulsifier (Soya Lecithin), Natural Vanilla Flavouring. Cocoa Solids 55% Min. Allergy Advice: See ingredients in Bold. May contain traces of nuts.